Is there a geographic component to support for Trump's wall? The largest factor in support for Donald Trump's proposed border wall is political affiliation: support is much higher among Republicans than among Democrats. But is there a geographic component to that support? For example, is a Republican in Laredo, Texas, more (or less) likely to support the wall than a Republican in Peoria, Illinois? ... the next chart shows that even over time, support follows Trump's approval ratings quite well. 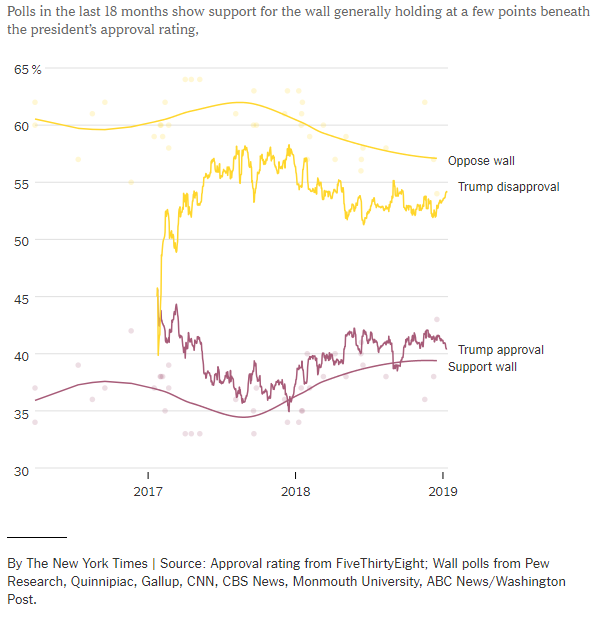 There is tentative evidence in the Fox data that the wall is particularly unpopular in the relatively white and rural West, but somewhat more popular, at least with respect to the president’s approval rating, in the Northeast and inland South. This would follow a familiar pattern in American politics: It mirrors the president’s support in the presidential primary and tracks with longstanding measures of racial resentment. Why isn't Election Day a federal holiday in the US? Border Wall GoFundMe - Is It Possible to Donate Money to the Government for a Specific Purpose?